In a just world, here is how the moderator should have dealt with the anti-American campaign’s VP candidate, Mike ‘The Quiet Hun’ Pence. 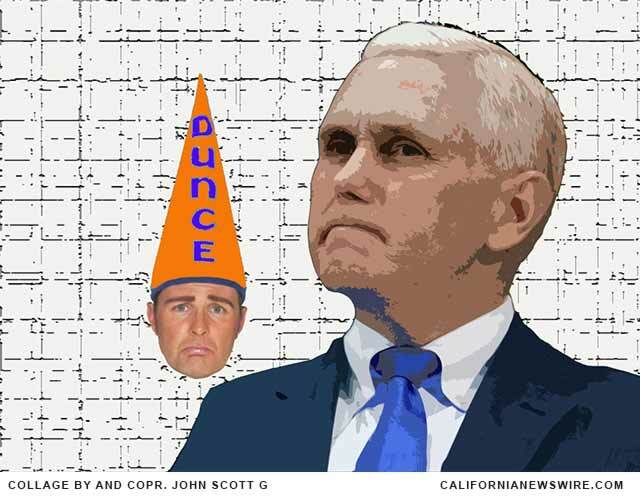 Mike Pence revealed his cowardice at the vice presidential candidates debate by not coming out and admitting he loathes members of the LGBTQ community. While there can never be enough fact-checking of right-wing nut-job candidates, moderator Elaine Quijano tried to be fair to the member of the Party of Stupid. But that approach lets a dangerous demagogue off the hook. Quijano: Governor Pence, there are a number of areas where your positions differ from those of your running mate, Donald Trump. You supported NAFTA, while Donald Trump is now against it. You voted for the authorization for the Iraq war, which Donald Trump is now against. You were in favor of the Trans Pacific Partnership, or TPP, and your running mate opposes it. Quijano: You opposed Donald Trump’s unconstitutional ban on Muslims and offered verbal support to the Gold Star Family, the Khans, who Mr. Trump assailed and mocked. Quijano: You opposed Saddam Hussein, a brutal dictator who attacked, imprisoned and killed his own people, while Mr. Trump has praised him. Quijano: You spoke out against Russian computer hackers while your running mate encouraged them. Pence: Look, reasonable people can have differences among themselves. Quijano: I see. Let’s examine the concept of “reasonable people.” You harmed your state — and harmed the cause of justice — by signing an anti-LGBTQ law. Quijano: You deny the indisputable facts about climate change. Quijano: You don’t recognize that tobacco is deadly. Quijano: From your statements, you don’t seem to understand the concept of evolutionary biology. Quijano: You accused the Walt Disney organization of inserting political propaganda into their animated children’s films. Quijano: Getting to the main issue, how can anyone with a conscience join the campaign of something like a Trump? Quijano: As Steve Benen of MaddowBlog puts it, “Over the course of his strange career in politics, Donald Trump has repeatedly demonstrated a striking indifference towards public policy, current events, governmental institutions, international affairs, and occasionally, basic human decency.” Governor, your thoughts? Pence: I think that is a biased viewpoint. Quijano: How can a true viewpoint also be biased? Quijano: I have continually addressed you as Governor Pence and not “Mike.” Would you kindly act the same way? Quijano: Really? The racism, misogyny, homophobia, and xenophobia of your campaign and your adherents are acceptable but normal politeness is tearing our country apart? Quijano: Thank you, Governor Pence for what some people might call your inspiring insight and worldly wisdom. In a just world, that’s what would have happened. But then again, in a just world, decent people would not have to suffer from the effects of right-wing nut-job bigots.